Travel Notes on trip following Ostap Bender route. 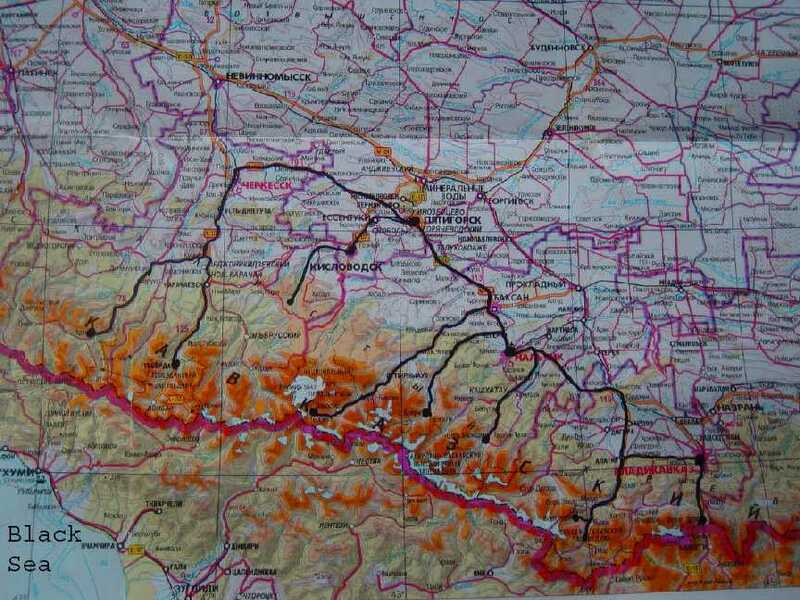 In two hours I will go on trip following Ostap Bender route. I will travel along Volga river, then turn to Caucasus. Map of trip is attached. Russians do not need explanation. Everybody knows who Ostap Bender is. I finished the Volga part of my trip. I started not from Nizhny Novgorod as I planned before, but from Yaroslavl, and I added pieces of famous "Golden Ring" to my trip. I took Golden Ring tour in 2001. However, when I am on tour and follow guide's direction, look at right, look at left, I do not really get feeling of discovery. Now after I went through Golden Ring on my own, I get much better feeling and understanding of it. Yaroslavl is big town with good churches here and where. May be because of this, it did not impress me much. 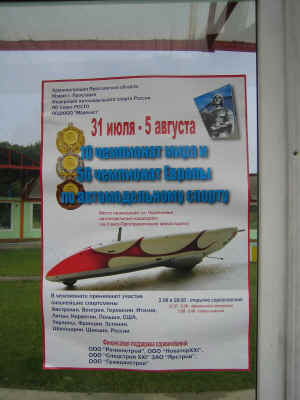 I attended unique sporting event: World and European championship on auto-modeling sport. Most of participants are a little bit strange. And I stayed in Circus hotel, which was cheapest in town. But I had good feeling toward it because two of my uncles worked in circus, one was gymnast another orchestra conductor. Rostov Veliky, especially its Kremlin pleasantly surprised me. I spent probably 4-5 hours in Kremlin. Rostov's atmosphere, an atmosphere of small town is very pleasant. I met in Rostov Russian/Switzerland couple who visited only small towns of Golden Ring and ignore big ones. It probably makes sense. 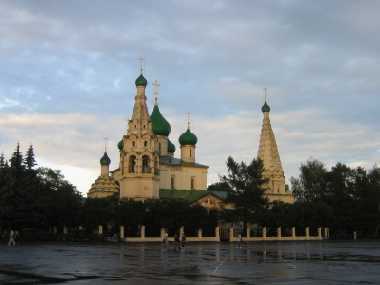 The next two towns from the Golden Ring were Vladimir and Suzdal. 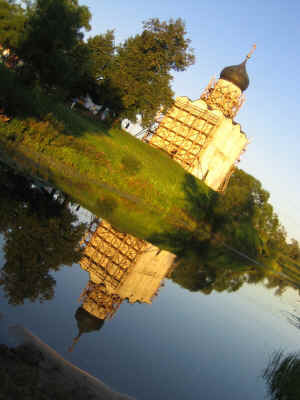 I went to Bogolyubovo near Vladimir to see Pokrova na Nerly church. Lonely Planet described Pokrova na Nerly, not as it usually says "one of", but wrote that Pokrova is just the best of Russian old churches. 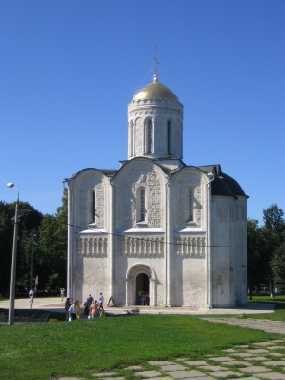 Suzdal is great, entire city got on UNESCO list and it is most popular destination for foreign tourists. And... it is became quite touristy because of it. After I finished with Golden Ring I went to Nizhny Novgorod, where I spent 4 days because my bicycle frame was broken on Saturday. Fortunately on following Monday it was welded. I visited Sakharov museum in Nizhny. The first time it was uncomfortable to ask a stranger in the street, where the Sakharov museum is. Everybody knows it. 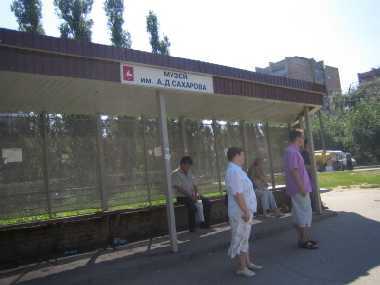 There is a bus stop called Sakharov museum. 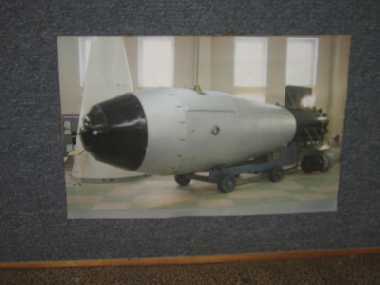 For my Western readers I should remind that Sakharov was a famous Russian dissident and creator of the H-Bomb. I was fortunate to know Sakhariov personally and now visiting his museum was kind of strange and moving experience. 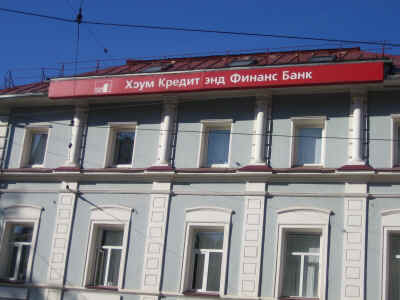 Nizhny is quite modernized city, most advertisement are in English or in Cyrillic equivalents, like in picture in attachment. Next after Nizhny was Kazan. Kazan impressed me, nice clean city with visible Tatar accent. Kazan Kremlin is outstanding. It is on UNESCO list. There are many beautiful mosques in town. Tatars are Muslims, but kind of special type. Next was Samara, former Kyibishev. Main attraction of Kyibishev is 100 ft deep Stalin's bunker. It was only recently open to public. From Samara I went to Volgograd. Volgograd was completely razed during WWII. New city is kind of featureless. Gigantic panorama of Stalingrad battle is quite impressive. My last stop was Astrakhan. For four days in a row I slept in trains and spent days sightseeing. It probably would be uncomfortable for a normal person. But for me, who is a bam inside, it was OK. Astrakhan is dusty provincial town with surprisingly most expensive hotels on my entire trip. The last portion of my trip was the most exciting one. I visited North Caucasus, particularly that part of Main Caucasian Gorge which contains highest mountains, roughly between mountains Elbrus and Kazbek, see map. I loved Caucasus and used to visit it frequently. Before I left Russia I was there for seven times attending different mountaineering schools, taking mountaineering treks and skiing. Last time I was there in 1978. Bad news about ethnic fighting, terrorists activities and different bureaucratic hurdles deterred me from visiting North Caucasus recently. 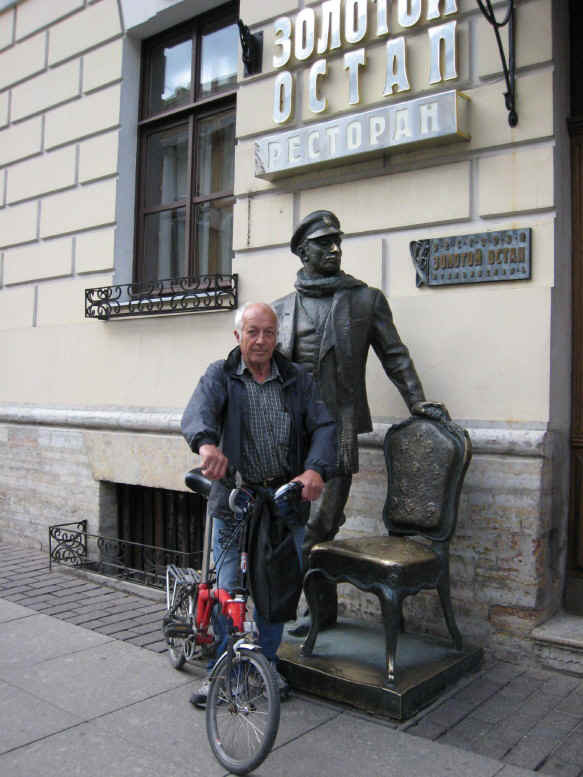 But this year I decided to visit it in-spite of these circumstances as part of my trip - following Ostap Bender route. And I am very glad that I did. While Russian and especially foreign tourists are not in a rush to visit Caucasus, it is not as bad as it seems. Actually I did not encounter any problems at all. In the past I rush to my mountaineering school or to starting point of backpacking trip and zoom through the rest of Caucasian region. This time I took different approach. Based in Piatigorsk, Kislovodsk, Nalchik and Vladicavkaz I took one of these one day tours offered by local tour agencies. I used it as one way ticket to high mountains. I exit bus in highest point and returned by bicycle riding mostly downhill. Folding bike seems to be indispensable because it easily fits even in smallest minibuses. Dombay is my favorite place. For first time I visit Dombay and fell in love with it in 1957, when I took initial course in the mountaineering camp "Dombay". All Dombay Meadow is covered with ugly construction sites now. But mountains above it are as beautiful as before. I stayed at huge dilapidated Soviet style hotel Gornie Veshini for $12. In Elbrus region I stayed in Cheget Meadow at hotel Cheget in "luxury" room for $20. I stayed there in winter 1978 while I was skiing there. Old and angry cleaning ladies in dirty gray overall still rule this hotel as 29 years ago. I get a ride to mountain chalet "Shelter for 11" located at 4200m on the slope of highest mountain in Europe, Elbrus, 5642m. I rode there on snow-cat for $12 from last station of cable car: "Bochki". Elbrus slope looks much nicer than Cheget. It will be interesting to ski there one day. I was able to follow Ostap Bender route on Georgian Military Road only to village Upper Lars, because road was closed at the border with Georgia. I am very satisfied with my trip to North Caucasus. I always wanted to learn more about these double named republics like Kabardino-Balkaria, Karachaevo-Chrkesia and so on. I wanted to know where they are located and what is the difference between them. Now I know exactly. Also in the past I zoomed through Kislovodsk and Piatigorsk on my way to mountains. But I never stay in them for a long time. Now I did, and I found that they are quite nice cities with lots of history and pleasant resort architecture. And they are not overrun by visitors, hotels are cheap, food is pleasant. They stayed this way because of the bad reputation of Caucasus. However the situation is improving quickly and in a few years they may became as touristy and overpriced as good places always do. 1. Map of my trip. Black Sea is in the lower left corner. 5. Elbrus from chair lift "Bochki"
6. Alp-lager Tsey. Director on forefront, Mt. Monk on back. 7. Muslim and Christian graves from 11 centuries in Upper Balkaria. 8. 10th century church in Arhis.